Тема в разделе "СКАМ", создана пользователем All-HYIPs.info, янв 2, 2019. 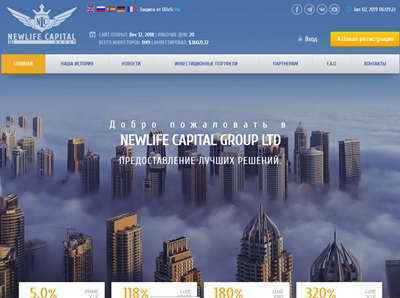 NewLife Capital Group - это ваша уверенность в будущем и стабильный доход в любой экономической ситуации. Гарантия успешной деятельности NewLife Capital Group основана на инновационной стратегии, которая практически не позволяет потерять или сократить капиталы. В принципе, весь оборотный капитал нашей компании можно дифференцировать в соответствии с условиями в некоторых ключевых областях. Самая большая площадь капитала - только для работы с бинарными опционами, и этот сектор выделяется для получения прибыли. Его объем составляет 80% оборотного капитала. Следующей ролью в масштабе, но не по важности, отрасль должна служить демпфер между условным провисанием и фактической волатильностью рынка. Его объем составляет 15% от общего оборотного капитала. Третий по величине сектор, чья миссия - стать стабилизационным фондом в случаях тактических искажений для отдельно взятого варианта, занимает 5% от общего оборотного капитала компании. 02.01.19 06:03 Transfer Sent Payment: 150.00 USD to account U12400368 from U1294xxx. Batch: 241470476. Memo: Shopping Cart Payment. Invoice 511, all-hyips.info. 04.01.19 06:47;Account;Receive;Received Payment 2.25 USD from account U12400368 to account U1294000. Batch: 241654083. Memo: API Payment. Invoice 595, all-hyips.info. 03.01.19 06:36;Account;Receive;Received Payment 2.25 USD from account U12400368 to account U1294000. Batch: 241558426. Memo: API Payment. Invoice 564, all-hyips.info. 05.01.19 06:11;Account;Receive;Received Payment 2.25 USD from account U12400368 to account U1294000. Batch: 241746704. Memo: API Payment. Invoice 626, all-hyips.info. 07.01.19 18:56;Account;Receive;Received Payment 2.25 USD from account U12400368 to account U1294000. Batch: 241993541. Memo: API Payment. Invoice 725, all-hyips.info. 06.01.19 18:39;Account;Receive;Received Payment 2.25 USD from account U12400368 to account U1294000. Batch: 241893244. Memo: API Payment. Invoice 697, all-hyips.info. 09.01.19 17:12;Account;Receive;Received Payment 2.25 USD from account U12400368 to account U1294000. Batch: 242209578. Memo: API Payment. Invoice 777, all-hyips.info. 08.01.19 17:56;Account;Receive;Received Payment 2.25 USD from account U12400368 to account U1294000. Batch: 242100753. Memo: API Payment. Invoice 752, all-hyips.info. 11.01.19 17:36;Account;Receive;Received Payment 2.25 USD from account U7693759 to account U1294000. Batch: 242429297. Memo: API Payment. Invoice 838, all-hyips.info. 10.01.19 18:15;Account;Receive;Received Payment 2.25 USD from account U7693759 to account U1294000. Batch: 242325731. Memo: API Payment. Invoice 811, all-hyips.info. 14.01.19 07:06;Account;Receive;Received Payment 2.25 USD from account U7693759 to account U1294000. Batch: 242658281. Memo: API Payment. Invoice 936, all-hyips.info. 13.01.19 18:05;Account;Receive;Received Payment 2.25 USD from account U7693759 to account U1294000. Batch: 242619165. Memo: API Payment. Invoice 915, all-hyips.info. 12.01.19 19:01;Account;Receive;Received Payment 2.25 USD from account U7693759 to account U1294000. Batch: 242532561. Memo: API Payment. Invoice 877, all-hyips.info. 16.01.19 06:13;Account;Receive;Received Payment 2.25 USD from account U7693759 to account U1294000. Batch: 242885651. Memo: API Payment. Invoice 1004, all-hyips.info. 15.01.19 07:19;Account;Receive;Received Payment 2.25 USD from account U7693759 to account U1294000. Batch: 242772560. Memo: API Payment. Invoice 965, all-hyips.info. 18.01.19 06:17;Account;Receive;Received Payment 2.25 USD from account U7693759 to account U1294000. Batch: 243097729. Memo: API Payment. Invoice 1095, all-hyips.info. 17.01.19 06:16;Account;Receive;Received Payment 2.25 USD from account U7693759 to account U1294000. Batch: 242998511. Memo: API Payment. Invoice 1049, all-hyips.info. 19.01.19 09:23;Account;Receive;Received Payment 2.25 USD from account U7693759 to account U1294000. Batch: 243217301. Memo: API Payment. Invoice 1137, all-hyips.info. 21.01.19 08:18;Account;Receive;Received Payment 2.25 USD from account U7693759 to account U1294000. Batch: 243401835. Memo: API Payment. Invoice 1239, all-hyips.info. 20.01.19 17:26;Account;Receive;Received Payment 2.25 USD from account U7693759 to account U1294000. Batch: 243353197. Memo: API Payment. Invoice 1205, all-hyips.info. 23.01.19 18:33;Account;Receive;Received Payment 2.85 USD from account U7693759 to account U1294000. Batch: 243706925. Memo: API Payment. Invoice 1404, all-hyips.info. 22.01.19 18:26;Account;Receive;Received Payment 2.25 USD from account U7693759 to account U1294000. Batch: 243589564. Memo: API Payment. Invoice 1323, all-hyips.info. 24.01.19 19:01;Account;Receive;Received Payment 2.25 USD from account U7693759 to account U1294000. Batch: 243819598. Memo: API Payment. Invoice 1466, all-hyips.info. 26.01.19 03:18;Account;Receive;Received Payment 2.25 USD from account U7693759 to account U1294000. Batch: 243948556. Memo: API Payment. Invoice 1542, all-hyips.info. 27.01.19 04:16;Account;Receive;Received Payment 2.25 USD from account U7693759 to account U1294000. Batch: 244041417. Memo: API Payment. Invoice 1627, all-hyips.info. 28.01.19 03:49;Account;Receive;Received Payment 2.25 USD from account U7693759 to account U1294000. Batch: 244136984. Memo: API Payment. Invoice 1687, all-hyips.info. 29.01.19 07:01;Account;Receive;Received Payment 2.25 USD from account U7693759 to account U1294000. Batch: 244267775. Memo: API Payment. Invoice 1751, all-hyips.info. 30.01.19 04:36;Account;Receive;Received Payment 2.25 USD from account U7693759 to account U1294000. Batch: 244381102. Memo: API Payment. Invoice 1840, all-hyips.info. 31.01.19 05:26;Account;Receive;Received Payment 2.25 USD from account U7693759 to account U1294000. Batch: 244502685. Memo: API Payment. Invoice 1916, all-hyips.info. 30.01.19 18:08;Account;Receive;Received Payment 2.1 USD from account U7693759 to account U1294000. Batch: 244466243. Memo: API Payment. Invoice 1878, all-hyips.info. 01.02.19 02:19;Account;Receive;Received Payment 2.85 USD from account U7693759 to account U1294000. Batch: 244610090. Memo: API Payment. Invoice 1977, all-hyips.info.